Pebble essential oil candles are like an invigorating and playful day on the beach! This unisex bergamot and black pepper blend is ideal for homes and offices, and make the perfect gift. Made from vegan soy wax and high quality 100% natural essential oils. 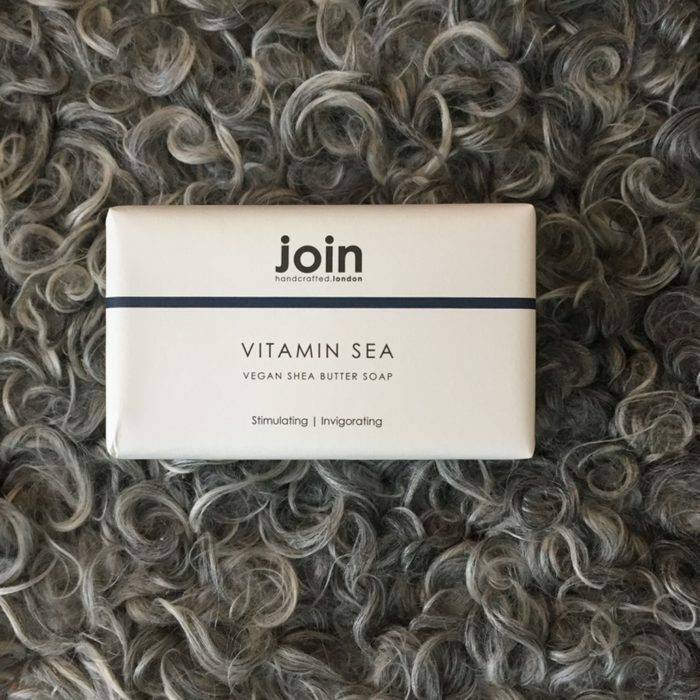 A refreshing Vitamin Sea vegan handmade soap bar, crafted in the UK. It is a triple milled blend of natural seaweed and shea butter. The invigorating seaweed has a fresh, salty fragrance and the 100% vegetable based shea butter leaves skin feeling moisturised. So this is no ordinary natural soap; your skin and senses will thank you for it. A substantial 200g bar wrapped in a minimal, monochrome recycled design, this luxury soap is the perfect sustainable product for your kitchen sink, bathroom or as a guest soap. Combined with Join’s vegan scented candles, room mists and essential oil diffusers, these natural fragrances will leave a comforting and welcoming aroma in your home. There’s a natural scent for every mood! You can see all Join products here.